The panacea deck hanger hook is made to add hanging items to your deck. The tall arch at the top of this item leads to a small hook, where you can connect your favorite hanging accent. The hanger accommodates bird feeders, hanging baskets, wind chimes, and other items up to 16-inch in diameter, perfectly highlighting your deck. Mount the flat base of the hanger onto a wall, deck, or wooden fence panel using the four included screws. The black color blends with any surrounding, and the sturdy metal construction will provide a hanger for years to come. Display your hanging items in new places with help from this deck hanger hook. Available in black color. Measures 8.5-inch diameter by 12.375-inch width by 18.125-inch height. 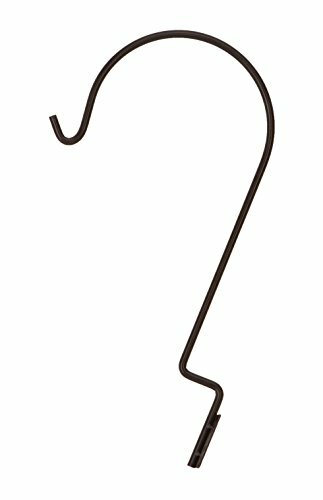 GrayBunny GB-6878W1 Victorian Wall Hook, 14 Inch, White, For Bird Feeders, Planters, Lanterns, Wind Chimes, As Wall Brackets and More!